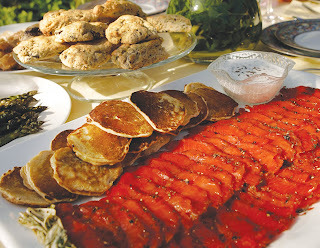 Among the offerings for Wednesday's food section is a no-fuss way of putting on a spring-inspired brunch. Among the recipe suggestions are pancakes made from leeks. Leeks have become one of my favorite vegetables to cook with. They're related to onions and such, but the flavor profile is totally different. In case you aren't familiar with them, they look like green onions (scallions) on steroids. Their flavor is stronger than scallions, but not quite as pungent than common bulb onions. You cook mostly with the white part, although I do use the leaves when I'm making vegetable stock. When cooking with leeks, be sure to wash them carefully, opening up the tightly packed leaves to rinse away any dirt or debris. I often will slice some, fry them up in butter, then toss them in a roasting bag with small, red potatoes that have been cut in half or quartered. A splash of olive, oil, some salt and pepper, and you've got dinner. 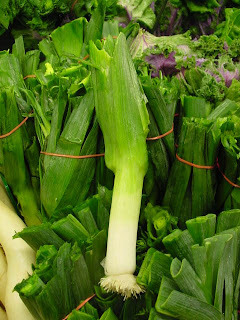 Sliced leeks sauteed in butter also liven up mashed potatoes. 1 cup kamut flour (you can get it at Whole Foods grocery) If you don't have it, just go with a regular all-purpose flour. In a large cast-iron skillet over medium heat, saute the leeks in 6 tablespoons of butter with a pinch of salt until soft and just barely beginning to caramelize, about 10 minutes. Remove from the heat and allow to cool in the pan. In a large bowl, whisk together the eggs and milk until well-blended. Add the flour, kamut flour, 1 teaspoon salt and the white pepper and baking powder and whisk together until combined. After the leeks are cooled, mix the leeks into the batter, being sure to add all the melted butter from the pan. Heat the same cast-iron skillet over medium heat, adding a little more butter if necessary. Ladle a heaping tablespoon of batter for each pancake into the pan, and cook until bubbles form and the underside is golden brown, about 1 1/2 minutes. Flip and finish cooking about 1 minute on the other side. Repeat with the rest of the batter, keeping the pancakes warm on a plate near the stove. Each pancake: 34 calories; 1 gram protein; 4 grams carbohydrates; 0 fiber; 2 grams fat; 1 gram saturated fat; 16 mg. cholesterol; 58 mg. sodium.